Austin, Texas – The South by Southwest® (SXSW®) Film Conference and Festival announced the world premiere of Everybody Wants Some as its Opening Night film for the 23rd edition of SXSW Film on March 11, 2016 in Austin, Texas. 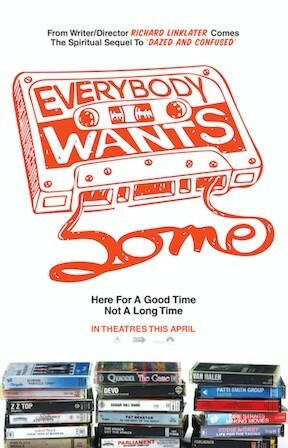 Set in the world of 1980s college life, Everybody Wants Some is a comedy, directed and written by Richard Linklater, that follows a group of college baseball players as they navigate their way through the freedoms and responsibilities of unsupervised adulthood. Get ready for the best weekend ever. Richard Linklater is a world-class filmmaker who put Austin on the map. He creates consistently stellar work including Slacker, Dazed and Confused, Waking Life, Scanner Darkly, School of Rock, Bernie, Fast Food Nation, the Midnight trilogy and last year’s Academy Award®-nominated Boyhood. Linklater also serves as the Artistic Director for the Austin Film Society, which he founded in 1985. Everybody Wants Some features an ensemble cast of Will Brittain, Zoey Deutch, Ryan Anthony Guzman, Tyler Hoechlin, Blake Jenner, Glen Powell and Wyatt Russell. The film is written and directed by Richard Linklater and produced by Megan Ellison of Annapurna Pictures, Richard Linklater and Ginger Sledge. Paramount Pictures will release the film on April 15, 2016. Everybody Wants Some is designated as a SXsports film, which means that Film, Interactive, Gold, and Platinum badges all have access to attend the screening. Register for a SXSW badge today at sxsw.com/attend, and join us March 11 – 20, 2016 for unparalleled access to screenings, sessions, parties, the SXSW Trade Show and, of course, a creative and inspirational experience that only SXSW can deliver. Be sure to register soon, and gain access to conveniently located hotels. Register by 11:59pm CT on Friday, November 20 and save off the walk-up rate. The South by Southwest® (SXSW®) Conferences & Festivals offer the unique industry convergence of music, film, and Interactive technologies. Fostering creative and professional growth, SXSW is the premier destination for discovery. The event is a launch pad for innovative content with new media presentations, music showcases and film screenings providing exposure for creators and compelling entertainment for attendees. For more information, please visit sxsw.com. SXSW 2016 is sponsored by Esurance, Mazda, Monster Energy Capitol One, Bud Light, McDonalds and The Austin Chronicle.